Happy National Trivia day, ya nerds! In honor of this very special day dedicated to the great institution of trivia, we have built a four-person game buzzer interface to bring some game show action into your very own living room! The year 2017 has finally arrived, and we all want to do better this year. Why not start by breathing some new life into your game night? An extra competitive edge is guaranteed! This DIY game buzzer uses the SparkFun RedBoard connected to four momentary push buttons---each representing a player or team: red, yellow, green and blue. There is an LED for each team in its corresponding color and one speaker. When your game night host asks a question, each team has the opportunity to buzz in. 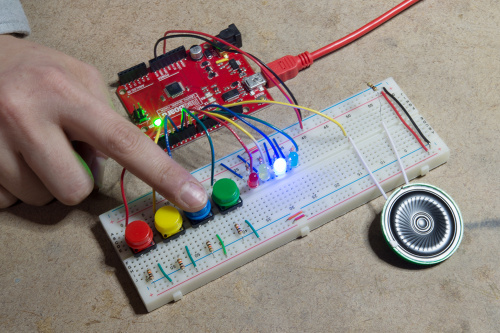 When the first team pushes its button, the corresponding LED will light up for five seconds and a unique tone will play on the speaker for one second. There will also be an indication on the serial monitor as to which team succeeded in buzzing in first. Once the first team manages to press its button, the rest of the players or teams become "locked out" for five seconds so there is no confusion regarding who hit the button first! Use the following diagram to build your circuit. I set up the example as a four-player/team console with each color representing a player/team. However, you can increase or reduce the number of buttons and LEDs to suit your game night crew’s needs. Finally, copy and paste the following code into your Arduino IDE and upload it to your board. //repeat the following code block for each button included. make sure to update the variable names when copy and pasting this block. ...And just like that, you have your very own game buzzer. With this little project, game night is entirely transformed! 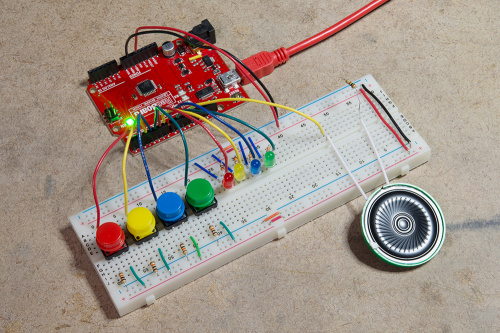 Feel free to take your game play off the breadboard by fabricating individual buzzers for each player/team! Have you made a trivia-related project? Share your trivia and game night projects with us on Twitter, facebook, and in the Comments below! I think today's post is a great example of the value of open source and community collaboration. I applaud SparkFun for receiving criticism positively. That is not an easy thing to do. 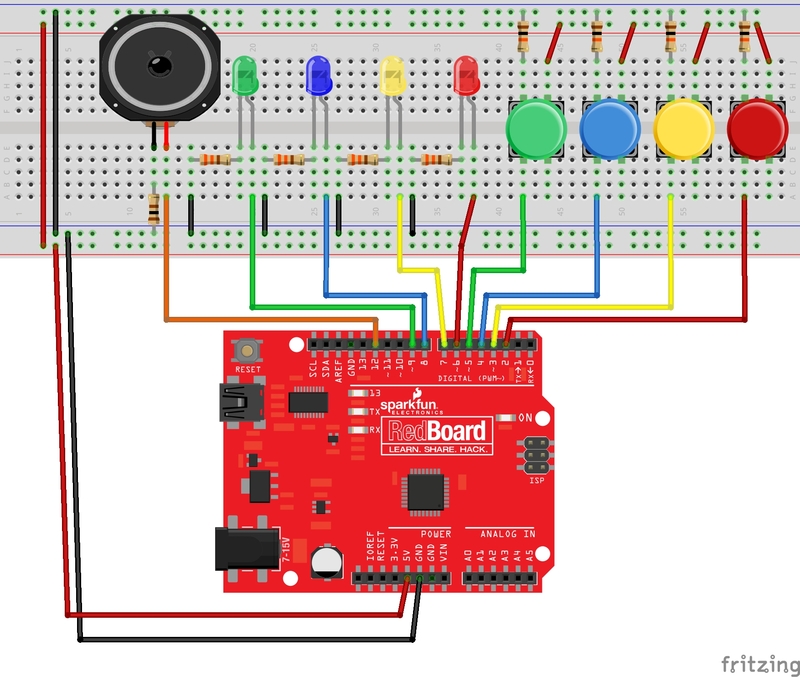 If one were follow the fritzing diagram exactly, the red LED would not light up. The jumper connecting the resistor to ground is in the wrong place. Good eye! Thank you for catching our mistake. We have updated the fritzing diagram in the post. FWIW, reading the inputs sequentially can skew the results, as it will take several microseconds to complete a "test loop". Also note that there is the possibility that two players can push the button at exactly the same time, and the color order will give one the "win" rather than declaring a "tie". Unfortunately there's no convenient way to do a "parallel read" on an Arduino. If I were to design this as a "product", I'd definitely use some other processor where I could read all four inputs simultaneously in hardware. An alternative would be to add some sort of a "latch" that captures the first input state change and causes an interrupt on the processor while latching the input state. The CPU could then examine to see (a) if more than one bit went high (meaning a tie) and (b) which one(s) are high. For simple amusement purposes, though, this is probably "good enough", as the delay times are pretty small. You can read all of the digital pins on the same port simultaneously. Thanks! I stand (or more accurately, sit) corrected! The technique I would use would be to read PIND into a "local" variable (doing a logical "AND" to mask out the irrelevant bits), then test it for zero. When that's non-zero, at least one of the buttons has been pressed, so need to drop into code to deal with it. Is it just me, or does it look like blue buzzes in first in the GIF, even though green is indicated as the first? which does not have any effect (should only have one equals sign). You got away with it because the check of pause has no meaning; it will always be false at the start of loop, since delay() prevents the Arduino default code from executing loop() again during the period when pause is true. Also, if you want to guarantee that only one of the button codes was run each loop around, the button checks should be inside if and else ifs instead of all independent ifs.